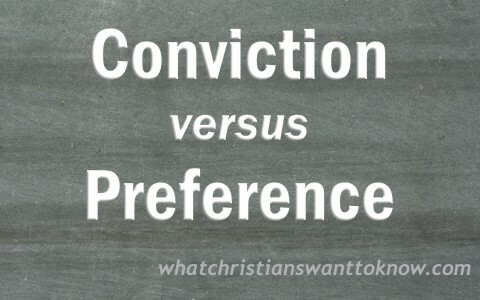 Conviction Versus Preference: What’s the Difference? Often I meet people that express to me that they are Christians. Then, before long in the conversation they will describe to me how God spoke to them and convicted them that they should be doing a certain thing. When asked to explain what it was that they were told by God, most of the time, what they claim that God has told them is in direct contradiction to what God says in His Word. Instead, what I often find is that their conviction, really was not a conviction at all, it was a preference. It is important to know what is the difference between a conviction and a preference, especially if we are going to make the claim that it was God that told you to do it. CONVICTION, noun 1.The act of proving, finding or determining to be guilty of an offense charged against a person before a legal tribunal; as by confession, by the verdict of a jury, or by the sentence of other tribunal, as in the summary convictions before commissioners of the revenue. The act of convincing, or compelling one to admit the truth of a charge; the act of convincing of sin or sinfulness; the state of being convinced or convicted by conscience; the state of being sensible of guilt; as, the convictions of a sinner may be temporary, or lasting and efficacious. By conviction a sinner is brought to repentance. Men often sin against the conviction of their own consciences. The act of convincing of error; confutation; the act of compelling one to acknowledge his error, or the truth of what is alleged; as, the conviction of a heretic may induce him to abandon his errors. We can see from these historic definitions that the description of the word conviction in each had something in common. They all involve the convincing and acknowledgement that an error or sin has taken place when examined in the context of the law, standard of proof, or acknowledged truth. Biblically speaking, the word conviction or convict (elenchō) means to “confute, admonish:- convict, convince, tell a fault, rebuke, reprove”(2). In various forms of the word, the idea of conviction or rebuking for wrong doing is realized in light of God’s Word. PREF’ERENCE, noun The act of preferring one thing before another; estimation of one thing above another; choice of one thing rather than another.” The knowledge of things alone gives a value to our reasonings, and preference of one man’s knowledge over another’s. Biblically speaking, the word preference or prefer (proēgeomai) means “to lead the way for others, i.e. show deference :- prefer (4). In various forms of the word, a personal choice is made based on one’s own knowledge to choose one thing over another. What’s the difference between a conviction and a preference? The key to knowing the difference is based on the reasoning that led to the choice. In the case of a conviction, the choice is tied to the understanding and conviction of what God says is the right choice vs. the wrong choice. A preference does not necessarily have to have any Biblical influence. Instead, a preference is left up to the individual. Simply stated, a preference may or may not involve a Biblical influence, but a conviction must always have a Biblical influence. Why is it important to understand the difference between a conviction and a preference? As mentioned at the beginning of this article, if we are not making our choices based on the conviction of the Holy Spirit according to God’s Word, then our self-proclaimed conviction is nothing more than a preference that does not originate from God. The danger in this is that our choice is not from God, it is from self and subject to the influences of the lust of the flesh, the lust of the eyes, and pride (Genesis 3:6; 1 John 2:15-16). When this happens, then our choices, made in what we claim are God’s name are nothing more than using the Lord’s name in vain and leads others to believe that our ungodly choices came from God. We must always consider what God’s word says in light of all choices. This means that even if a choice is a very trivial one, we should stop for a moment to consider if it may have any component that may cause dishonor to God or cause a others to stumble in their relationship with Him or others. The key to knowing the difference between a conviction and a preference is based on the reasoning that led to the choice. If the reasoning is based on the influence of the Holy Spirit based on the truth of God’s Word it is a conviction. If it is based on a personal choice without the truth of God’s Word, it is a preference. Confusing the two can have severe consequences. Resources – (1) Webster, Noah (1828) “Conviction”. Webster’s Revised Unabridged Dictionary (1828): American Dictionary of the English Language, Retrieved from http://webstersdictionary1828.com/Dictionary/conviction. (2) Strong, James (2014). “Convict”. Strong’s number G1651. Strong’s Talking Greek & Hebrew Dictionary. Webster, Noah (1828) (3) “Preference”. Webster’s Revised Unabridged Dictionary (1828): American Dictionary of the English Language, Retrieved from http://webstersdictionary1828.com/Dictionary/preference. (4) Strong, James (2014). “Prefer”. Strong’s number G4285. Strong’s Talking Greek & Hebrew Dictionary. Next post: Did Adam And Eve Have Belly Buttons (Navels)?